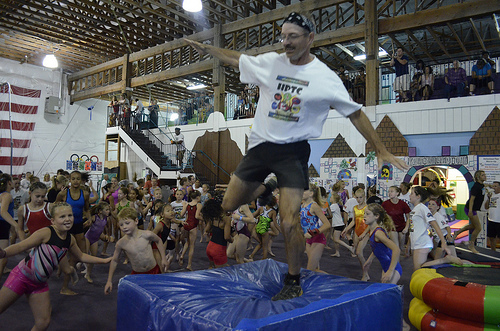 Inspired by the work of Gymnastics coach educator Keith Russell from Canada, we videotaped over 170 of the best games and activities for kids. Tumbl Trak sponsored the videos. You can find them on the Tumbl Trak YouTube channel. The first 22 – ORGANIZING kids – were just published. Click PLAY or watch those on YouTube. MORE will be coming over the coming months. More Air Mats for fun and fitness in a safe environment. The Power Launch has seen a lot of action in therapy clinics and schools that work with children who have sensory needs. Wait till you see the innovative uses we’ve come up with!! More videos like this on Tumbl Trak the Grow Through Movement playlist. The unique inflatable Fitness Wheel is ideal for those with special needs. And ALL CHILDREN are special. It’s great for everyone. Tumbl Trak just posted a series of videos on Special Needs Gymnastics. Browse the Grow Through Movement playlist. Former Chinese team member Liang Cheng now coaches at Capital City Gymnastics in Edmonton, Canada. He and Jeff Thomson, former Men’s Programme Director for Gymnastics Canada, now CEO of Inspire Sports, want to bring Recreational Gymnastics to China. Here’s a video from the first Gym opening in 2011. Click PLAY or watch it on YouTube. Starting out at the age of seven, Beth went on to become an Olympic Bronze Medalist, triple World Champion, six-time European Champion, Commonwealth Champion and seven-times consecutive National Champion, cementing her place as Britain’s greatest ever-female gymnast. Although memories of Beth taking the Bronze in the Uneven Bars at London 2012 – the culmination of an incredible career – will not be forgotten anytime soon, sharing a fierce passion for gymnastics with future generations has become her new focus. So how can parents encourage their kids to exercise? What’s more important for kids starting out in sport, fun or desire? Click through to learn more about this fitness watch called the LeapBand. related – National Team member Dan Keatings is visiting U.K. schools to promote fitness, sport and healthy living.